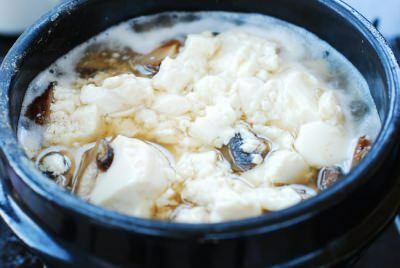 Soondubu jjigae (순두부 찌개) is a stew made with smooth tofu curds, soondubu (also spelled sundubu), also known as silken or extra soft tofu. 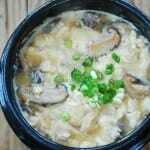 This is the third soondubu jjigae recipe on the blog. The stew is more commonly made spicy as I showed in the other two recipes — kimchi soondubu and haemul (seafood) soondubu. Sometimes, I like it purely white without any red spiciness for the simple pleasure of savoring the nuttiness of the silky tofu. You can make white soondubu stew with any broth or add-ins, but my favorite is one made with finely ground perilla seeds (deulkkae). 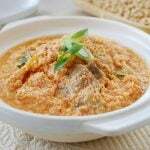 It really gives the creamy tofu distinct nutty flavors! 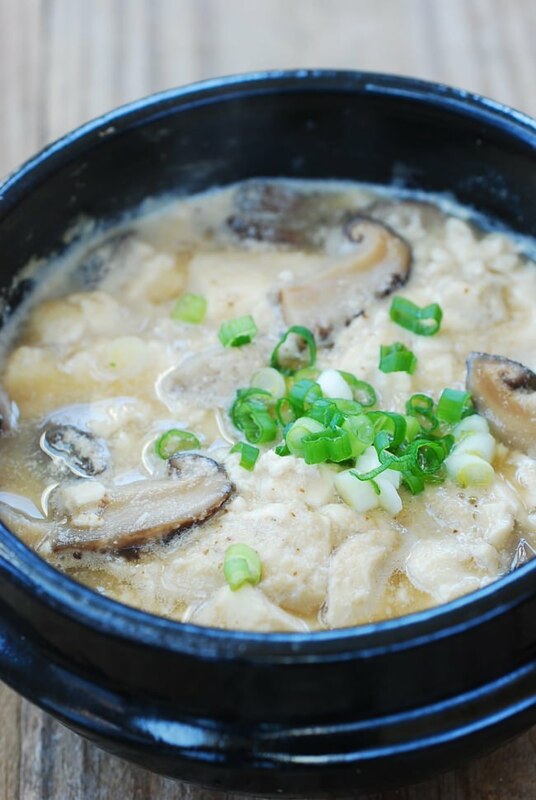 Most restaurants specializing in soondubu have this deulkkae variation on their menu. Although not as common as sesame seeds and oil, perilla seeds and oil are a staple in Korean cuisine. Perilla seeds have a deep, earthy taste with a hint of minty flavor similar to that of perilla leaves. 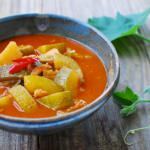 They are used in various dishes such as namul dishes and stews and especially popular in country-style and temple cooking. There are hulled and unhulled ground perilla seeds sold in Korean markets. While the hulled (lighter color) version is better to keep the stew white, either one should be fine for the taste. 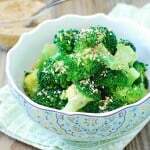 If perilla seeds are not available, you can substitute with finely ground sesame seeds. 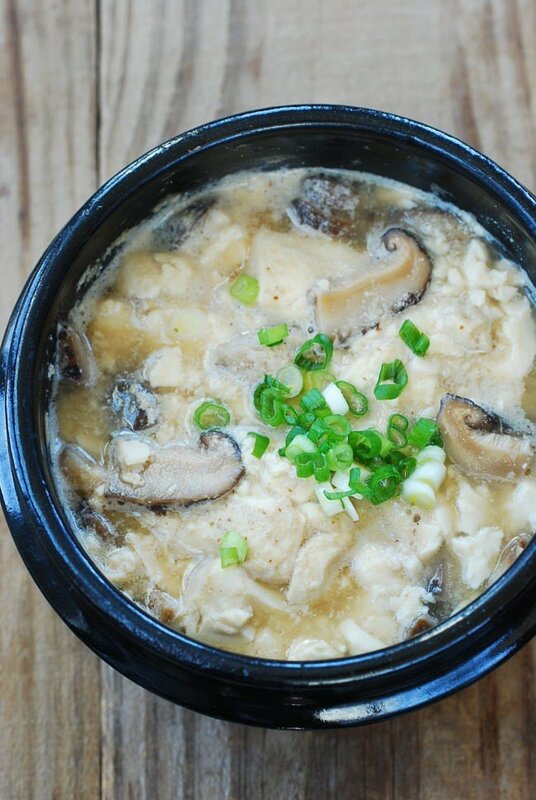 For the broth, I used a small piece of dashima and 1 dried shiitake mushroom. It really doesn’t take much! You can use more. Any kind of dried mushrooms or fresh mushrooms will work. I like dried mushrooms because they, of course, have more intense flavors for making broth. 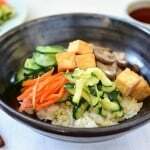 This recipe is vegan! 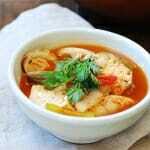 If preferred, anchovy or meat/seafood based broth can be used as well. 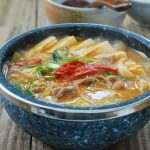 It’s quick and easy to whip up a bubbling pot of flavorful stew with a package of sundubu, which is why it’s one of my favorites for a weeknight meal! Not to mention how warm and comforting it is on a cold fall/winter night. This recipe yields one large serving or two small servings, but you can easily double or triple the recipe for a larger family. 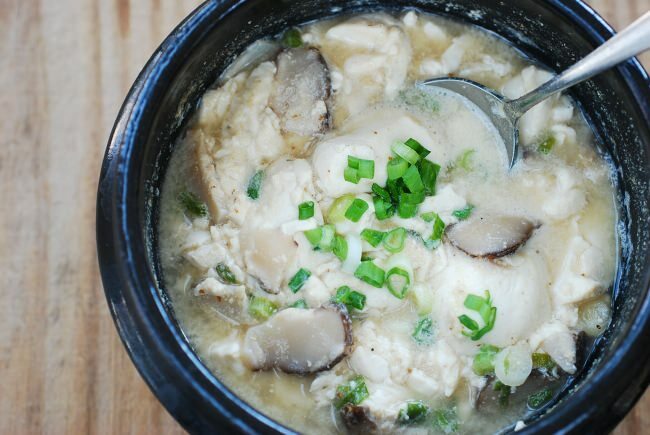 Soft tofu stew made with perilla seeds and mushrooms. It's vegan! 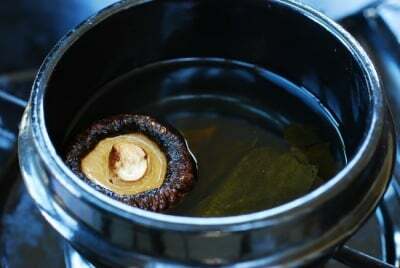 Add the mushroom and dashima to a small pot with 1 cup of water. Let it sit for about 10 minutes if your dried mushroom is thick, or you can break it up to help rehydrate faster. Bring the pot to a boil, and reduce the heat to medium. Boil for 5 to 7 minutes. Remove the dashima and mushroom. When cool enough to handle, cut the mushroom in half and thinly slice to add back to the pot. Add the soondubu, garlic, soup soy sauce, and pepper to the pot. Bring it to a boil over medium heat, and cook for 3 to 4 minutes. Stir in the perilla seeds, and boil for another minute or two. Drizzle the perilla (or sesame) oil over the stew. Add the chopped scallion right before turning the heat off. This looks absolutely delicious. Winter comfort food. I’m going to try this tonight. Tks for sharing your recipes! After cooking this for the 1st time some months ago its made its way into my weekly food routine. So lovely and great to miss meat a couple of nights a week. Aww that’s great to hear! This is a definite favorite of mine. Thank you! I made this for my family last night doubled. It was mild flavored compared to the spicy soondubu and we really enjoyed it. First tried this in Korea and was looking for a recipe. Didn’t know it was so easy! 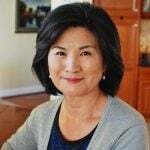 Thanks for delving into unknown recipes for us!